In recent years, there has been a renewed interest in, and awareness of, indigenous cultures all around the world. In the travel and tourism industry, aboriginal societies and heritage sites have emerged as distinct and culturally-rich destinations unto themselves. To some extent the travel experiences that first nations societies provide travellers, in North America especially, can go a long way to redressing the wrongs of the past by providing more accurate information; and by giving a much fuller perspective on the lessons of history. And today aboriginal nations, such as the Cherokee, also represent a renewed self-determination and greater level of self-sufficiency that in previous eras was denied to aboriginal people because of systemic discrimination in what was called “The New World”, a term in which is inherent a kind of historical amnesia about the real first immigrants to what today is known as The Americas. Like indigenous people throughout the world, the Cherokee in the 21st century are in many ways role models for self-determination and cultural survival. They also embody the universal principles of the interdependence and interconnectedness of all things. As one of the principal first nations in the Americas, they also personify the multicultural nature of all humankind. But, like so many aboriginal peoples, their successes and triumphs did not come easy. When the first Europeans arrived in the so-called “New World”, it was as if a monumental and endless seismic shift had begun. The lives and cultures of First Nations peoples throughout the Americas would be irrevocably changed. What ensued was, as history has shown elsewhere in the world, a clash of cultures that was especially exacerbated by the colonial ambitions of European powers, in particular British, French, and Spanish. As one of the indigenous peoples of the Americas, the Cherokee would suffer from the effects of the incursion of this empire-building. In their own language, they call themselves the Aniyunwiya, or the “principal people”; and even today many of the Cherokee prefer the name Tsalagi from their Iroquoian-based language. This nation of aboriginal people was also no stranger to forced migration; some historians suggest that they were displaced long ago from traditional lands in the northwest to the southern Appalachian region because of a defeat at the hands of the Iroquois and the Delaware. Linguists point to the language similarities between the Iroquois and the Cherokee; but there is no oral record of such a conflict in Iroquoian traditions. When the the first Europeans came into contact with the Cherokee in what today is the Carolinas, they found an agricultural-based people living in well-organized villages of between 30 to 60 houses among which was the larger council house where the sacred fire was maintained. Like the Iroquois to the north, the Cherokee were also organized in clans, each along matrilinear lines. As an agricultural people, they also depended to a great extent on “the three sisters” of corn, beans, and squash. This diet was supplemented by hunting and the harvesting of wild plants. It was the Spanish explorer Hernando de Soto who first encountered the Cherokee while leading the first European expedition in 1540 to penetrate and explore deep into what today is the United States of America. He also is credited with “discovering” the Mississippi River and ended his life on the banks of that great waterway. Because they were relatively isolated by the resource-rich and mountainous terrain of the southeast, the Cherokee did not come into frequent and direct contact with Europeans until the establishment of the colony of Virginia in 1609 and subsequently by the founding of the Carolina colonies. Traditionally the Cherokee traded with other indigenous people but as the European colonies grew, they also became trading partners and competitors with non-aboriginal people. And whereas the Cherokee were a highly-organized society in which priests and warriors played prominent roles, that hierarchy began to shift as the “business” of trading evolved. Before long, the Cherokee became hunters in search of material gains and profits. As their dependency on trading increased, the Cherokee tunred to the British as allies in their conflicts with the French and the Spanish. The “imported” colonial ambitions of these European powers therefore aggravated rivalries between the Cherokee and other coastal native-Americans in the southeast and increasingly caused the area to become destabilized. The Cherokee eventually solidified their alliance with the British and British interests because the latter’s interests were not served by pushing the Cherokee into the French or Spanish camps. Colonel George Chicken was commissioned by the British government to assure the trading alliance; and at one point a Cherokee delegation was even sent to England for an audience with King George II. And then in 1754, the Cherokee signed a treaty with the British in which they confirmed the alliance. This also led to the construction of British forts in traditional Cherokee territory which had the added advantage of defending the newly born colonies. 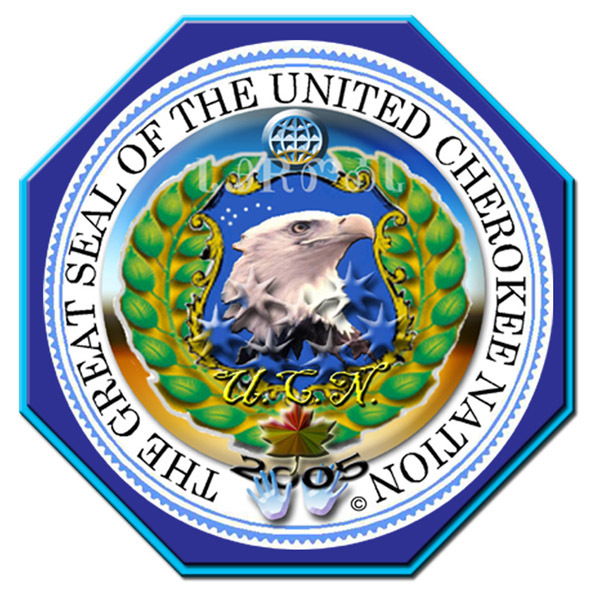 But given the “geopolitical” state of affairs of the time, and the soon to be new Republic on this side of the Atlantic, the Cherokee (like other Native-American nations) became embroiled in the shifting dynamics and struggles that colonialism and a new sense of self-determination were creating in what soon would be the United States of America. When, for example, the British defeated the French in 1759 at the Battle of the Plains of Abraham in what today is Québec City, “British North America” became a major force that divided even more the allegiances and alliances of the First Nations people of North America. And for the Cherokee who soon witnessed white settlers pouring into their traditional homeland, the necessity of finding new alliances became critical. For example, treaties were signed by the Cherokee with South Carolina and Virginia, but not without losses. And as the American Revolution approached, the Cherokee strove to remain neutral, but like anyone who has been caught in a cultural crossfire knows, this was easier said than done. And when independence of the new Republic was declared, and when in 1803 France gave up that enormous tract of land ceded under the Louisiana Purchase, the inevitability of an expanded new “American” nation became even more certain as more and more European settlers poured across the Appalachians, and the westward frontier movement intensified. By the 1800s, the Cherokee, a progressive nation of the southeast, had created a written constitution (and a written language), their own court system, schools, and a way of life that was often the envy of their European neighbours. Many were prosperous farmers with impressive herds of livestock. Although many still lived in simple log cabins, other Cherokees continued to prosper. Chief John Ross, for example, had a $10,000 house designed by an architect from Philadelphia. When Andrew Jackson was elected President in 1828 and when gold was discovered in northern Georgia, a renewed clash of cultures began. The idea of displacement of the Cherokee was not new; the plan had been suggested by Thomas Jefferson as early as 1802. And in his final address to Congress in 1825 President James Monroe called for “Indian removal” west of the Mississippi. And that river became a Rubicon in American history and point of no return, especially for the Cherokee. And then, with Andrew Jackson’s full support, the Indian Removal Act was introduced in Congress in 1829. “Chief Justice John Marshall, writing for the Court, acknowledged that the plight of the Cherokee and other Native American tribes was real: they were ‘gradually sinking beneath our superior policy.’ The Court, however, could not base its analysis on sympathy. Marshall concluded that before the merits of the Cherokee case could be considered, the Court had to determine whether it had jurisdiction to hear the case at all. The Cherokee argued they were a foreign state, pointing out that the tribe was a distinct political society that managed its own affairs, and that both the colonial and U.S. governments had regarded them as a state. The fact that the federal government negotiated treaties with the Cherokee seemed to be good evidence that the tribe was regarded as a foreign state. This particular piece of the historical puzzle highlights even more the fundamental question of identity and the collective sense of self. And despite the fact that Chief Ross travelled to Washington to protest the decision, President Jackson refused to see him. The situation seemed hopeless. But overtures were subsequently made to Major Ridge, a prominent Cherokee and other leaders all of whom deemed it inevitable that a treaty would need to be signed, the Treaty of New Echota. This treaty essentially exchanged Cherokee land east of the Mississippi for land in what today is Oklahoma. And even though the treaty was rejected by Chief Ross and a majority of the Cherokee National Council, it was nevertheless ratified by the U.S. Senate. Ross tried every political and legal strategy for two years to stop the removal but in May of 1838, 7000 U.S. soldiers moved into the Cherokee’s traditional homeland and the forced march began. For the Cherokee the Nunadautsun’t (“the trail where we cried”) was the ultimate betrayal. History would know it as the Trail of Tears. The conditions under which the removal of the Cherokee took place were brutal; they were marched west to Oklahoma under miserable conditions suffering from exposure to the elements, disease, adn even starvation. Over 4000 of the died en route, including the wife of John Ross. Tragically, the Cherokee would continue to be caught in the crossfire of events unfolding in the new nation known as The United States of America. During the American Civil War (or the War Between the States), the Cherokee found themselves in conflict with members of their own native-American nation; some enlisted in the Confederate Army, others fought for the Union and what ensued was equally tragic internecine violence. The clash of cultures went straight to the heart of the Cherokee people when brother fought brother. In the 21st century the Cherokee Nation has not only survived the vicissitudes of history but it has flourished, evidence once again of the indomitable spirit of people who are free. 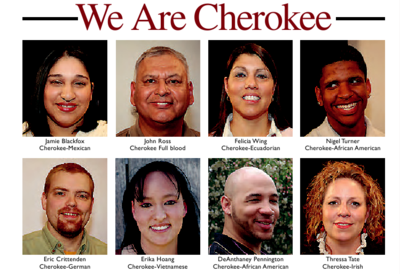 Today the Cherokee are the largest Native-American group in the United States. (a) For an extensive list of titles, click here.